Tag line: "She's such a sweet girl. He's such a nice boy. They'll scare the hell out of you"
Movies often rely on fantasy to create a world for their audience. 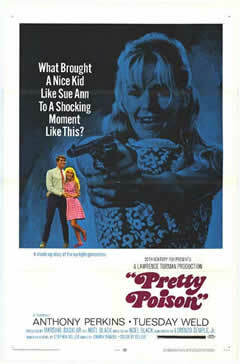 Pretty Poison does the opposite; showing us, in no uncertain terms, how little time the real world has for make-believe. In fact, some fantasies can lead straight to disaster. Dennis Pitt (Anthony Perkins), a born liar who often confused fantasy with reality, has just been released from a mental institution, which declared him fit to face the outside world. Looking for a fresh start, Dennis moves to a new town and accepts a job at the local factory. But when he attracts the attention of Sue Ann (Tuesday Weld), a High School cheerleader with an outgoing personality, he immediately reverts back to his old ways, spinning one lie after another in order to impress her. By telling Sue Ann he's a CIA operative on a secret mission, Dennis wins the young girl's affections, but is Sue Ann truly as naive as she appears, or is Dennis heading for more trouble than he’s ever known before? Anthony Perkins is quite good as Dennis, the mentally disturbed lover in way over his head, yet it's Tuesday Weld who steals the show, giving us a seemingly average girl entertaining some less-than-average, not to mention very disturbing, thoughts. At first, Dennis believes he's won her over with his tall tales, even going so far as to ask Sue Ann to assist him on his most recent ‘mission’ for the CIA. But it isn’t long before events spiral out of Dennis’ control, only to be scooped up by the deceptively sweet Sue Ann. Their relationship may have started on Dennis’ terms, yet it's Sue Ann who ultimately pulls the strings. Dennis’ case worker, Morton Azenauer (John Randolph), had advised him before his release that he was entering a world which had little time for fantasy. It was advice he wished he’d taken.